Orlando, Fla. (4 August 2015) – There is no place like home, and when Luis Bacardi’s Rum Bum Racing travels to Road America each year, it feels like a homecoming for the team and its drivers Matt Plumb and Hugh Plumb. Wisconsin is the home state of Jennifer Bacardi and a large contingent of Rum Bum supporters are always on hand at the legendary Road America road course in Elkhart Lake. There is another big reason for the team to call Road America home, and that is the performances the team has put in at the high-speed track through the years. Over the past four races at the circuit, Rum Bum Racing has claimed three podium results, including two victories. Rum Bum was poised for its fourth consecutive Road America podium last year when a rare ball joint failure cruelly took the team out of third place with just three laps to go in the race. Rum Bum Racing seeks redemption this year, as the 2015 IMSA Continental Tire SportsCar Challenge championship enters its final four races of the season. The Rum Bum team currently sits second in the championship standings, 24 points back from the top spot with 171 points. 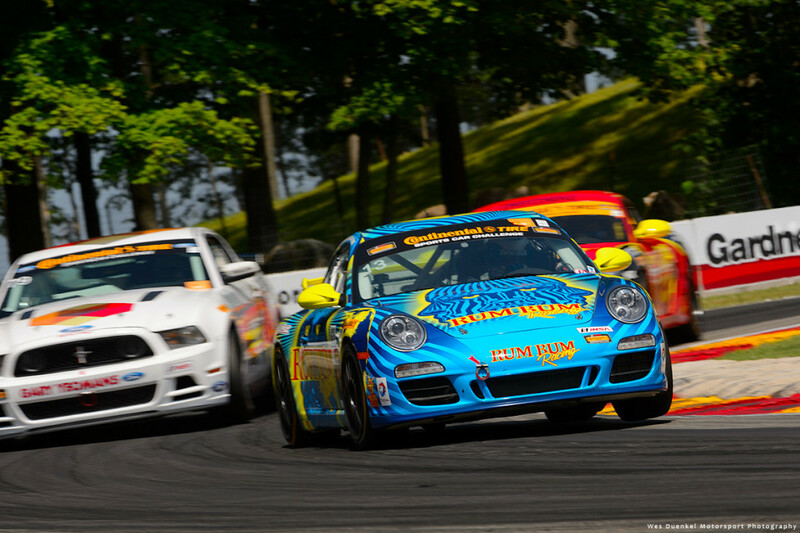 Following the Lime Rock round two weeks ago in which the No. 13 Rum Bum Racing Porsche was hit out of contention while running second, the Rum Bum squad is all the more hungry for another trip to the Road America podium. The Road America event gets underway with a Promoter Test day on Thursday. Official practice and qualifying is set to take place on Friday with the 2.5-hour race set to go green on Saturday at 12:20 PM Central Time (1:20 PM ET). IMSA.com will have LIVE streaming of qualifying and the race. Fans can also watch via the IMSA app. Scoring.imsa.com will have live timing and scoring throughout the weekend. This entry was posted in News & Stuff and tagged bacardi, elkhart, hugh plumb, lake, matt plumb, racing, road america, rum bum, rumbum, wisconsin. Bookmark the permalink.